Jamie Goodgarden was the galaxy’s favorite entertainer. Movie star, recording artist, best-selling author: Goodgarden did it all and fans the universe-wide loved him. That is, until one day he decides to take a leisurely walk to the grocery store and somebody blows his head off with a model 9-24 snipeblazer. The assassin is arrested almost immediately, but H.B. Fist smells a rat. His ensuing investigation unravels what might be a universe-spanning conspiracy involving Goodgarden and two opposing factions: the League of Vampires, an organization made up of the infamous bloodsuckers, and the Veganistas, a militant group of extreme vegetarians. Aided by the Goodgarden’s longtime agent (or what’s left of him), Fist traverses the galaxy again to seek out the truth and to deliver justice to evildoers. And, hey, he just might nail a movie deal in the process. 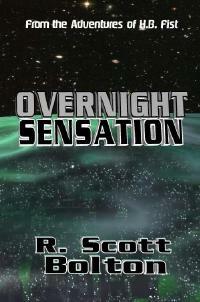 If you are tired of reading about wizards and about vampires who drive Volvo's, and listen to their iPod's then grab a copy of "Overnight Sensation". The vampires in this story are a force to be reckoned with. H.B. Fist is back with a new adventure and plenty of action to boot. His quest to find out whodunit is a maze of interviews, catch phrases and more twists than a pretzel. You'll be turning pages with anticipation to find out what happens next and with plenty of wit and wisdom R. Scott Bolton's H.B. Fist character will take you into his world for the mystery of Jamie Goodgarden.